Netflix is an international public company that allows users to stream movies and television shows online with a monthly subscription. They also offer rentals by mail for an additional cost and produce their own original programming. Reed Hastings and Marc Randolph founded Netflix in 1997 as an online movie rental service. 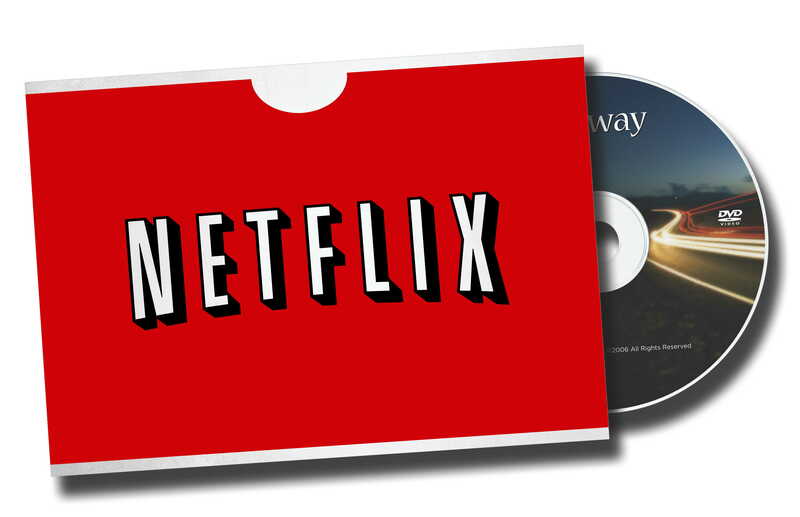 In 2007, Netflix introduced streaming services that allowed members to use personal computers to instantly watch movies and television shows online. In 2012, Netflix began producing original content and became the first Internet TV network to be nominated for the primetime Emmy with 31 nominations in 2013 . Currently in 2014, Netflix has over 53 million members in nearly 50 countries worldwide and accounts for more than 34 percent of the peak wired download traffic in North America . Netflix is publically held. According to the company’s 2014 third quarter report, it has $1,223 billion in total revenue, a 27% increase from the same quarter of the previous year. The company reported a 20% increase in domestic revenue from the same quarter of the previous year and a 47% increase in international revenue due to their expanded global market. Netflix predicts a 6% increase in total revenue and an additional 4 million subscribers by the end of the fourth quarter, bringing their total revenue up to $1,305 billion and their global membership to 57 million. Netflix’s two major competitors are Hulu and Amazon . Over a 3-month period, Netflix’s highest share price was $484.39. However, after a massive 25% drop on October 16th, the price dropped to $361.70 and eventually reached it’s lowest share price of $346.59 on November 30th . The 25% drop in share price occurred a day after Netflix reported that the company’s subscriber growth was below the original forecast. Netflix speculates that the subscriber growth was lower than anticipated as a result of the increased price for membership that was announced in May 2014 . The price increased $1 from $7.99 to $8.99 monthly . For the past couple of years, Netflix has been working to increase their international presence. Since 2012, Netflix has been available internationally in the UK, Ireland, Denmark, Finland, Norway, and Sweden and in the Netherlands since 2013. In September of 2014, Netflix announced that streaming services are now available to subscribers in Germany, France, Austria, Switzerland, Belgium and Luxembourg via all devices with Internet access including computers, smartphones, and video game consoles . Then, in November of 2014, Netflix announced, that by March of 2015, it will expand into New Zealand and Australia . Since its start in 1997, the company has never released how many people watch each show on Netflix. The company claims that because their revenue comes from subscribers and not advertisers, the only number that matters is their subscriber count. The company’s decision bothers networks such as HBO, Showtime, and Starz, who also rely on subscribers and not advertisers, but who have their ratings recorded by Nielsen . However, according to the Wall Street Journal, Nielsen is going to start measuring viewership for streaming services like Netflix. Starting next month, Nielsen will use already existing in-home metering devices to record Netflix viewership without the need of the company’s permission. Nielsen, however, will not be able to record viewership via mobile devices, a platform heavily used for Netflix streaming . Netflix started producing original programming in 2012 with the release their first series Lilyhammer starring former Sopranos star Steven Van Zandt . Since then, the company has produced a number of successes such as Orange is the New Black, winning 3 Primetime Emmy Awards , and House of Cards, winning 4 Primetime Emmy Awards . In addition to producing their own content, Netflix picks up dropped on-the-air television shows and continues to produce them. Arrested Development, for example, was off the air for a number of years before Netflix produced its fourth season in 2013. In August of 2014, the network confirmed that it will be producing a fifth season in the coming year . On June 19, 2014, Netflix announced the company’s pairing with Chelsea Handler to produce a Netflix original comedy talk show. Handler decided to pair with Netflix in order to keep herself new and interesting. The talk show will debut in early 2016 . However, on October 10th, the network premiered a stand up comedy performance from Handler’s latest comedy tour, Uganda Be Kidding Me, as her debut to Netflix . On September 30, 2014, Netflix announced their pairing with the Weinstein Company to release their first original movie. The movie will be a sequel to Crouching Tiger Hidden Dragon, a 2002 martial-arts epic movie directed by Ang Lee, also the director of Life of Pi and Brokeback Mountain . The sequel will be titled Crouching Tiger Hidden Dragon: The Green Legend and will be directed by Yuen Wo-ping. It will be produced by Harvey Weinstein, Academy Award winner for The King’s Speech, Peter Berg, Emmy Award winner for Friday Night Lights, and Sarah Aubrey, producer of Lone Survivor. The film tells a martial arts story where good and evil battle for the fate of the Martial World. Major stars of the film will include Harry Shum Jr., Jason Scott Lee, Roger Yuan, and Eugenia Yuan . It will be released and available to all subscribers on August 28, 2015 as well as in select global IMAX theaters . Days later, on October 2nd, Netflix announced a deal they made with Adam Sandler, comedy actor and founder of Happy Madison Productions . Sandler, alongside Happy Madison Productions, committed to acting and producing four films exclusively available through Netflix. The first movie could come as early as late 2015 and currently has no theatrical component . Netflix will be premiering two original programming pieces on December 12, 2014. The first is Marco Polo, a series centered on Marco Polo’s exploration during the time of the 13th century war in China and will be produced by The Weinstein Company . The second is a stand-up comedy special, American Ham, with actor Nick Offerman, known for his role in NBS’s Parks and Recreation. The special will appear in the US, Canada, the UK, and Ireland . The company will continue their original series in 2016 with a relationship sitcom called Love. Judd Apatow, known for producing Knocked Up and 40-Year-Old Virgin, will co-write and produce this Netflix original series . Another sitcom in the works is Grace and Frankie, starring Lily Tomlin and Jane Fonda. The show is targeted to premier in summer 2015 . Twitter was initially part of a podcasting firm called Odeo and became its own company in 2007. The company expanded its user base immensely during the 2007 SXSW Conference after successfully placing two plasma screens that streamed Twitter messages. In 2010, Twitter announced that they would offer paid advertising, or “promoted tweets” which has become a major revenue stream for the company. According to newly filed financial documents, Twitter has a net loss $133.8 million this year compared to a $70.7 million loss in 2012. However, their advertising profits are quickly rising as the company collected $168.6 million in third quarter, for a total of $422 million in total revenue. Twitter’s research and development costs are also growing immensely as the company believes these investments will turn into profit. R&D costs have increased a whopping 153% from last year alone. Twitter has also expanded an account specifically for breaking news called @EventParrot, which is a new service that allows for personalized notifications. This is a very recent feature but it shows that Twitter is recognizing their strength as an immediate news outlet. The major story for Twitter this quarter is their initial public offering. Goldman Sachs was announced as the lead underwriter on the deal and the company raised $1.8 billion from the IPO. As a result of the 70 million shares that Twitter issued, the company’s market value grew to a little over $13 billion. Twitter stock opened at $26 and rose rapidly on its first trading day and has settled to a low $40 range currently. 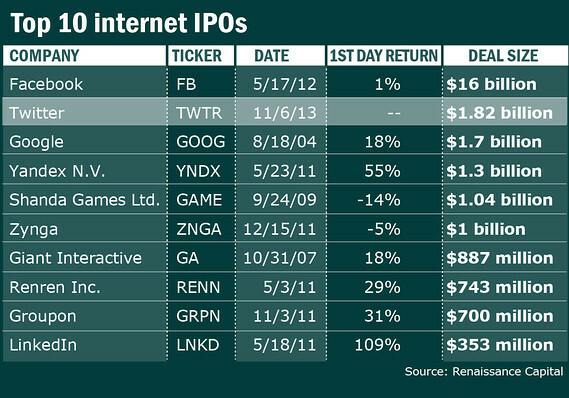 Twitter’s IPO marks the second largest Internet IPO after Facebook. The company opted to file its IPO on the NYSE, as NASDAQ is heavier with technology companies and is trading under the ticker name TWTR. Currently, analysts anticipate that Twitter will become profitable by 2015 as advertising revenue streams increase. There has been some worry that Twitter is not profitable as it has posted net losses for the past three years. However, investors believe that Twitter has opted to go public earlier in its growth curve and has more opportunity to become profitable in the coming years. As Twitter begins its first foray as a public company, there are many doubts that Twitter is just a fad and that their IPO will be overhyped and overvalued just like Facebook’s. However, based on growth expectations and expansions into news, Nielsen ratings and popular applications such as Vine, Twitter will surely be profitable by 2015. As social media becomes more measurable, Twitter stands to bring in higher revenue streams as advertisers begin to recognize the power of this social media platform. Gannett Broadcasting’s division is comprised of 23 television stations and its subsidiary Captivate. The former reaches 21 million households in 20 markets, which is approximately 18.2% of the U.S. population (2). The latter is a company that delivers news, information, and advertising through video monitors in elevators. They are currently located in North America and reach more than 4 million workers (4). At the end of 2011, the amount of employees, both full-time and part-time, totaled about 2,600 (5). As noted earlier the company owns 23 different television stations across the country, in 21 different markets. Seven of the 21 markets owned by Gannett are in the top 20 market (7). The ratings of these stations continue to do well. Lucky for Gannett, more than half of its stations are NBC affiliates, and this past November was the first time since 2003 that NBC ranked number one in the Nielsen prime time ratings programming amongst adults 18-49. This increased revenue, as many people tuned into the NBC programming. Furthermore, the past Summer Olympics in London were the most watched games in Olympic history, attracting more than 200 million people. KUSA-TV in Denver was the top rated NBC market affiliate during the two-week span of the games. 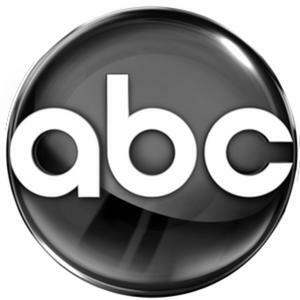 Their Atlanta and Minneapolis NBC affiliates were ranked second and third respectively; and their St. Louis and Phoenix did well. In total the Gannett owned affiliate stations took six of ten top NBC affiliate markets in terms of ratings during the Olympics (3). Gannett Company, Inc. is a publicly traded media holding company (GCI). On October 15 the third quarter results were released, and the broadcasting division’s success was monumental. Both revenue and profits were at a record high in all of Gannett broadcasting history. The operating revenue increased 36% from $174.3 million the last 3rd quarter to $237 million during the most recent 3rdquarter. The television revenue was also up 38.1% from $168.8 million a year ago to $233 million. The substantial increase is mostly attributed to advertising, which includes $41.7 million spent on political advertising and $37 million spent on the summer Olympics related ads. The Olympics brought in an unprecedented amount of revenue from advertising. Their total was up 18% from four years ago during the Beijing Olympic games. Part of the explanation was that Gannett reached out to local advertisers to sell television time to. Lougee is looking to increase the revenue even more during the 2014 Winter Olympic games in Sochi, Russia. In total, political revenue for the year will be $150 million. Prior to the 2012 election, Gannett lacked a strong political footprint, but that changed during this election. Because of more local coverage of elections, especially in swing state markets including Colorado, Florida, and Ohio, political advertising increased by a significant margin. Another source of the revenue came from retransmission fees, which accounted for $22.3 million. With retransmission consent in 2013, Gannett will receive 135-140 million from distributors, which is up 41 to 46% from 2012. The fourth quarter results are expected to be at an all time high. When the books are closed for Gannett’s fiscal year, the broadcasting division will report record growth and revenue (3) (9). As far as the stock market is concerned, the current share price for GCI is $17.88. Their share price has seen an incline for the most part, as a year ago it was being sold at $13.13 (10) Just recently, a report was released by Dividend Channel that named them the top dividend stock with insider buying. On October 23, the Board of Directors of Gannett announced that a dividend of $0.20 per share would be payable to stockholders just after the new year. As of now the company is on track to return dividends up to $1.3 billion through 2015. Throughout the UBS Global Media and Communications Conference a common theme that both the CEO and CFO spoke about was making sure an increasing level of capital is returned to their shareholders. Furthermore, there is currently a large amount of cash flow totaling over one billion dollars. That money will be used to return even more cash and to invest into things that will expand the Gannett brand (3) (11). In late May, Dish Network introduced its Auto Hop feature available on its DVR service. This new technology allows users to skip over commercials on broadcast networks. While this is beneficial for TV viewers it hurts the broadcasters who lose advertising revenue. As a result of this feature, Dish Network and Gannett were having difficulty renewing their retransmission agreements (12). Gannett was looking for a 300% rate increase to compensate for the loss of revenue from advertisers. Dish Network’s stance was that they wanted to take a stand for customer choice and control. Fortunately for subscribers, rather than suffer from a blackout, the two companies reached a deal as the October 7th deadline was slightly extended. The terms of the deal have not been released, but the new contract is long term according to press releases by both companies (13). DirecTV customers narrowly avoided a blackout of Gannett television stations across the country. As the November 30th deadline approached, Gannett warned their viewers that they may experience a blackout of affiliate stations until an agreement was reached. This was all because Gannett was looking for a fair deal for retransmission fees, while DirecTV said that Gannett was trying to get customers to pay almost twice what they pay now for their stations. While the deal was made by the deadline, the details of the agreement have not been made public yet (14).